Purina ONE Senior 7plus Chicken and Whole Grains dry cat food is tailored to meet the nutritional needs of senior cats, aged 7plus years. It contains all the key nutrients your cat needs to stay healthy and it also contains the unique Bifensis Dual Defense formula which supports your cat's natural defences. The balanced recipe with 24 vitamins and minerals supports vital functions and helps maintain renal health. It also promotes strong and healthy bones and mobility. This tasty kibble was developed by Purina's veterinary and nutritional experts and contains the exclusive Purina ONE Bifensis formula which supports your cat's health inside and out. It encourages a healthy digestive system and is scientifically proven to stimulate the intestinal immune system into secreting antibodies. Purina ONE Senior 7plus dry cat food also contains valuable omega fatty acids and zinc which promote supple, soft skin and shiny fur. The balanced mix of minerals supports a healthy urinary tract. This tasty, top quality dry cat food is free from any artificial additives. It is based on the most up to date scientific findings and meets your pet's nutritional needs for every life stage and lifestyle. 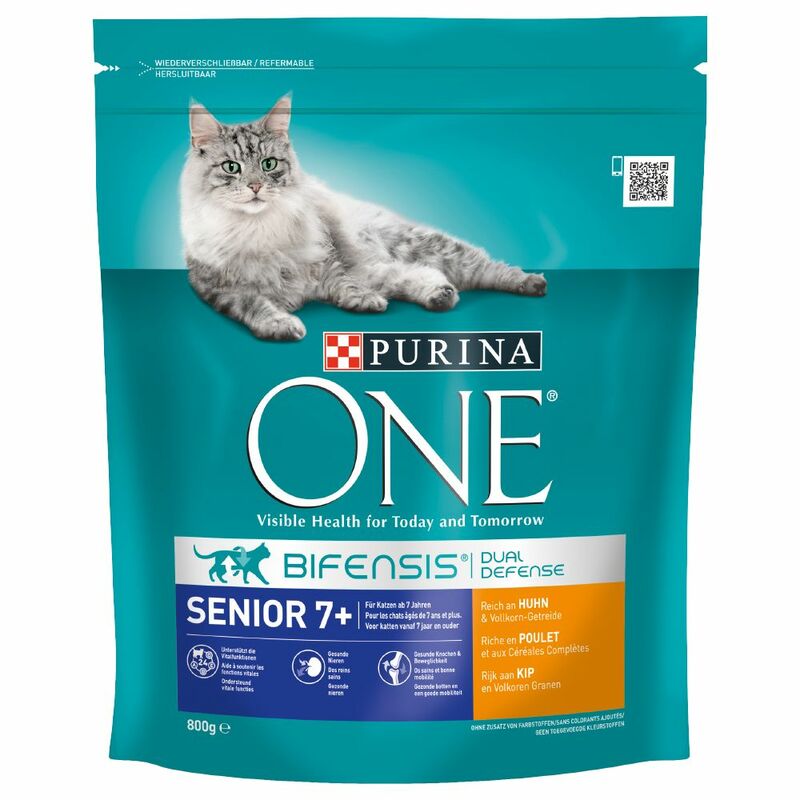 Purina ONE Senior 7plus complete dry cat food helps your older cat to stay happy and healthy – today and tomorrow! Purina One Senior 7plus Rich in Chicken and Whole Grains at a glance: Balanced dry food with health benefits, for senior adult cats 7plus years Formulated specifically to meet the nutritional needs of elderly cats Bifensis Dual Defense: Helps to protect your cat from the inside and out. Scientifically proven to stimulate the natural antibody production within the intestinal immune system. Omega 6 fatty acids promote healthy skin and fur With 24 vitamins and minerals: To help support your cat's vital functions Healthy kidneys: Thanks to an extra portion of vitamin E and C Strong bones: With vitamin D and rich in important minerals for healthy, strong bones Healthy urinary tract: A balanced mineral content promotes urinary tract health Oral hygiene: The crunchy kibble with eΒential nutrients keep teeth and gums healthy High nutrient absorbency: The nutrients in the high-quality ingredients are easy to absorb Balanced diet: Important key nutrients such as vitamins, minerals and trace elements support your cat's health Chicken as main ingredient: Full of valuable animal protein Whole grains Contains taurine: Vital nutrient for cats, important for cardiac function and eyesight Free from artificial additives, colour, taste enhancers and preservatives Developed by experts: Recipe is based on the most up to date scientific findings and recommended by vets Handy zip bag: Re-sealable packaging helps to retain aroma.